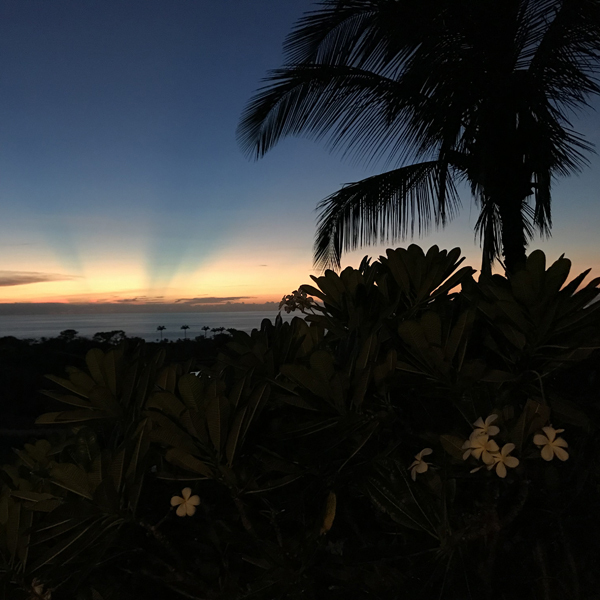 Until recently I thought that Maui was my favorite island, so over the last many years that was our most frequent vacation destination. 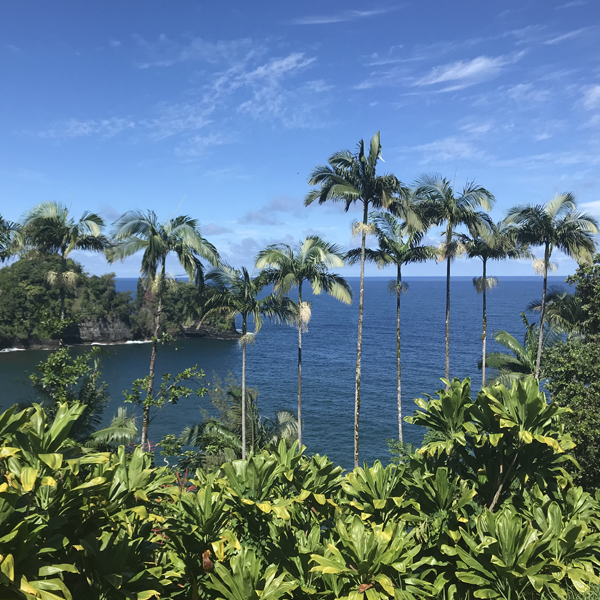 But this year we decided we wanted a change and, after a short hesitation, booked our trip to the Big Island of Hawaii. Just in case you were wondering, we hesitated because of the recent volcano eruption but then decided it would be fine. Luckily for us, many others were less adventurous, so … OK, I won’t say that we had the whole island to ourselves but it was much less crowded than it could have been. We managed to pack a lot into six days we spent there, and I plan to cover some of the highlights in the next several posts. But I want to start with the most appropriate topic for this blog: perfumes. Over years of going to Hawaii I collected a wardrobe of perfumes that I always bring with me. The only full bottle of perfume that has ever traveled with me anywhere is Bronze Goddess by Estee Lauder. I bring it with me to every tropical vacation (Big Island, Kauai and Maui). This time though I used it less often than I normally do because we shared the condo with our friends, and I couldn’t do my usual ritual of walking to the fridge (where I keep Bronze Goddess when in Hawaii), spraying it all over my body and putting on my clothes after that. But it still got several generous applications during the trip and enjoyed it every time. My “vacation in a bottle” perfume – Ginger Ciao by Yosh – was as great on actual vacation as I remembered. Tiare by Ormonde Jayne and I have rekindled our friendship after a recent cooling-off, and both Tiare and its sister Frangipani felt wonderfully appropriate for the place. Unexpectedly, I came to the realization that I should stop bringing to Hawaii Bombay Bling! 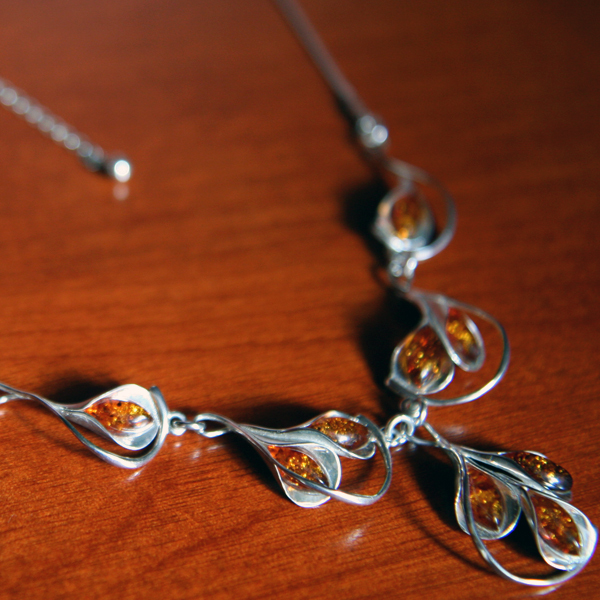 by Neela Vermeire Creations. For years I thought it was a very good fit and kept being slightly disappointed: it didn’t smell as great as I remembered and usually would disappear too quickly from my skin. This trip we stayed in for dinner more often than went out, so I got to wear Bombay Bling! in a well air-conditioned room. Under these circumstances, with little heat or humidity involved, this perfume bloomed wonderfully, and I could still smell it in my hair throughout the night. So, while I still love it, no more Hawaii vacations for Bombay Bling! L’Artisan Parfumeur’s Traversee du Bosphore and Byredo’s Pulp both are perfumes that I wear only in hot and humid weather, and these both were predictably good though I would prefer to spray them more liberally, which I couldn’t do this time: since the Island is called “Big” not for nothing, and it takes a couple of hours one way to get almost anywhere besides the close-by beach, we often voted for going somewhere in one car. And while it allowed us to spend more time in each other’s company, I had to be mindful of having four people in closed quarters for hours – so I was very discreet with my perfume application. One more perfume that has proved absolutely not suited for the tropical weather was Selva Do Brazil by Parfums Berdoues. 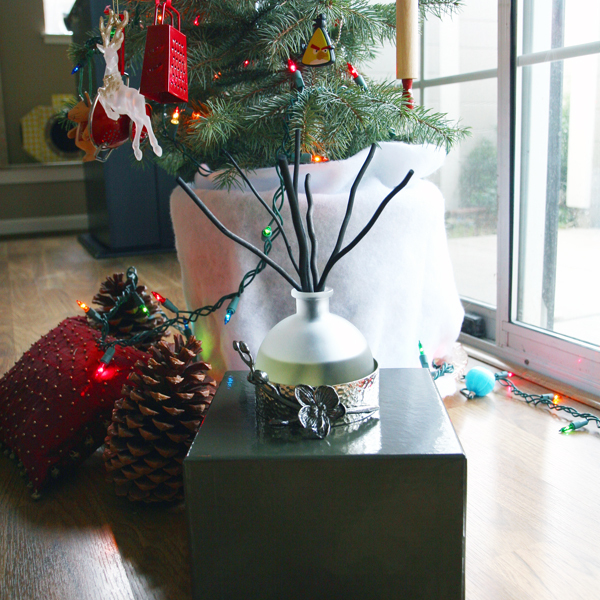 I brought my ScentBird decant of it with me thinking it would be just perfect there. It smelled very nice indeed… all 15 minutes that I could smell it either on me or on my vSO. I guess, Selva Do Brazi is one of those perfumes that are great to convey the idea of tropics rather than to be used there. Though, with hindsight, maybe it wasn’t that bad considering long car rides… Nah, probably still no. I also did some testing of new for me perfumes, but I’ll probably leave it for the next post. Do you have any perfumes that you always use for something particular – an event, place or something along these lines? Tara, previously of Olfactoria’s Travels, while being on the move to her own new virtual home, decided to visit a couple of friends’ blogs. I have the honor of hosting her first. Here’s one of her great reports on the PLL’s event. 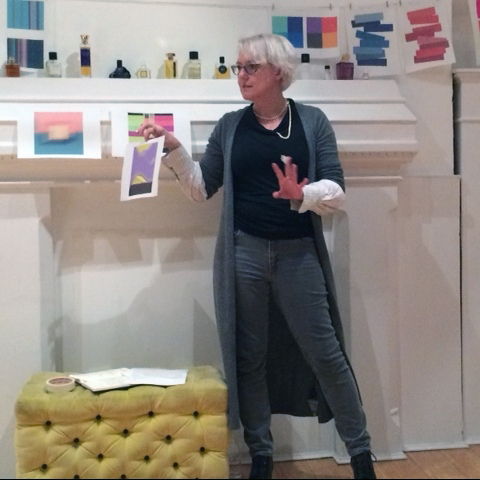 I was particularly looking forward to this evening at Perfume Lovers London because firstly, it was being led by my mate Sabine of Iridescents and secondly, we were going to have fun drawing our scent impressions. 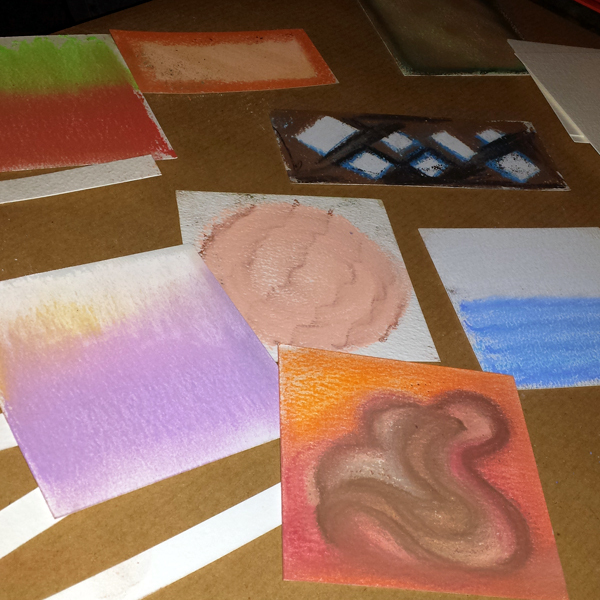 Instead of the usual rows of chairs, we were seated at tables laid out with paper and various art materials. Sabine had also provided some inspiration with print outs of various images and colour palettes. As you can imagine, there was less talking and more colouring going on than at a normal PLL event, but here’s an idea of what was said and some of the wonderful images from Sabine’s blog. Sabine: I went ten years without wearing perfume, then when I went back to it – wow – there had been an explosion in niche perfumery. I needed a way to organise and make sense of it. I am a graphic designer so I tried to translate perfume into colour. There are quite a lot of similarities between the two. Both are very subjective; my rose is not your rose and my red is not your red. We can describe both as being opaque, bright, transparent and so on. Sometimes there are not enough words. Colour is a way of creating a multi-sensory dimension which enhances your experience. 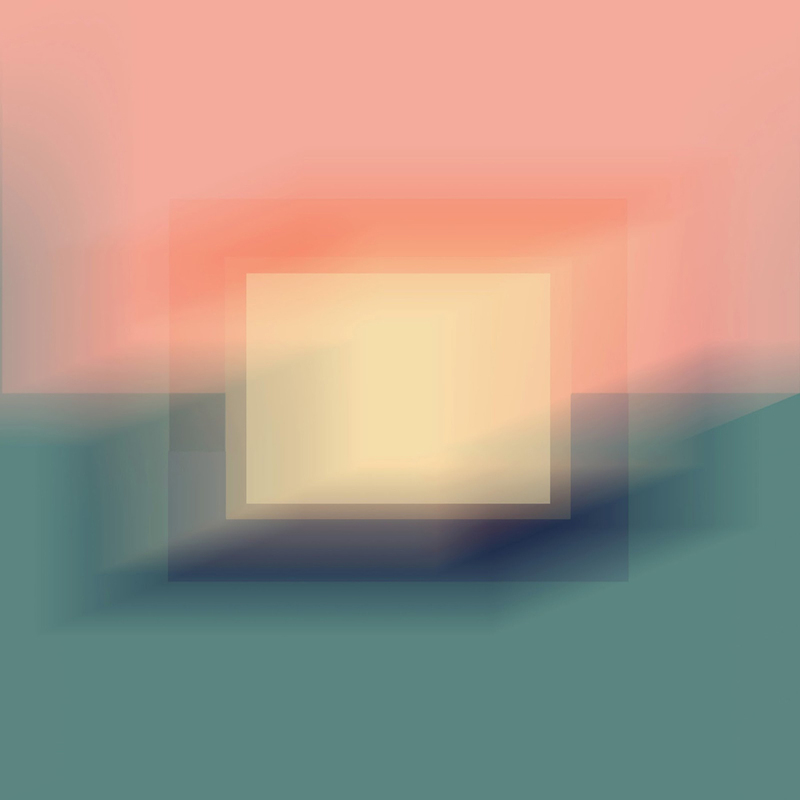 You can train your perception of colour in the same as you can train your perception of smell. This is why I started my blog, Iridescents, where I reproduce the images digitally. We can’t do that tonight but we do have paints, pencils and pastels so we can play around with how scents relate to colour. Lila: This is the first of the Aedes de Venustas fragrances and the perfumer is Bertrand Duchaufour. Sabine: Try to think of a palette of 2 or 3 colours. What colours does it make you think of? Audience members: “Pink”, “Green”, “The colours of a stick of rhubarb”. Sabine: The pinks and greens come and go in my composition and the notes in the perfume do the same. 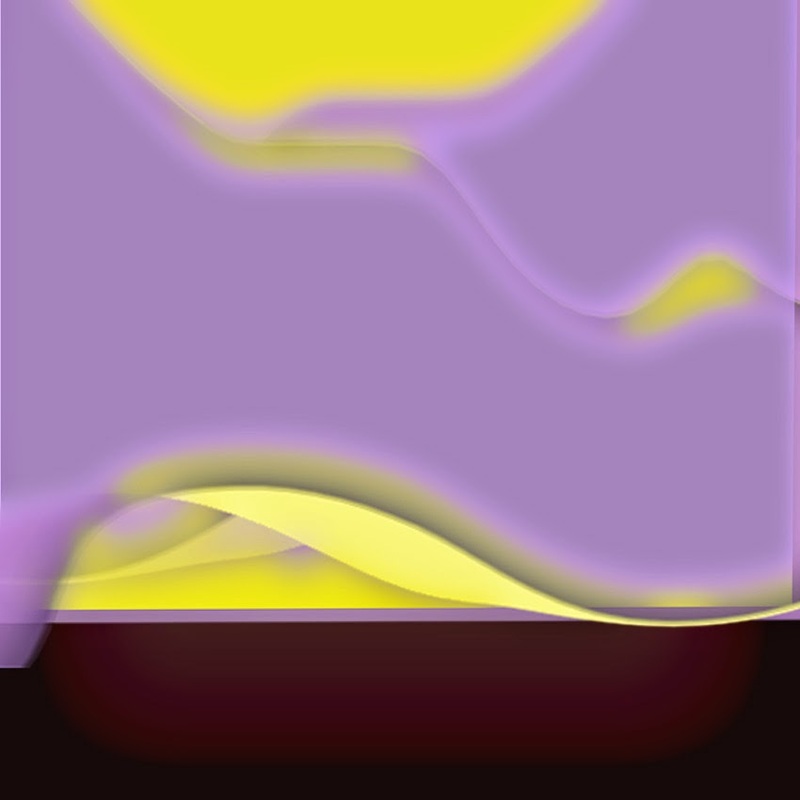 I think of it as very jazzy. There is not a structured top, middle and base. Lila: It’s very crisp and tart. Sabine: If a perfume makes you think of yellow say, try and think which yellow. The next one is not a perfume but a perfume ingredient. It’s vetiver oil. What colour does it make you think of? Sabine: This is a completely synthetic perfume, mostly made up of Iso E Super. So what colours do you use when you have a material not found in nature? Try and think of how much of one colour and how much of another. Think about the proportions. Sabine: Liquid Night is neither hot nor cold. It has hard shapes but it also has a softness to it. It’s very urban. It makes me think of driving in the rain and the reflection of the raindrops on the windscreen. Sabine: Felanilla is cosy and a little powdery from the iris. It’s also animalic but not too much. Audience member: Do people in different countries relate to colours differently? Sabine: Yes, for example people in warmer countries tend to wear warmer colours because their surroundings are brighter. People have different associations with colours, as they do with scents. People in cities tend to wear more muted and subdued colours. Sabine: If you think of Sel Marin as a scent representing the sea, which would it be in terms of colour – the Atlantic or the Med? Audience member: Would you wear it? Sabine: My husband is wearing it, and therefore it is a perfume I associate with him. 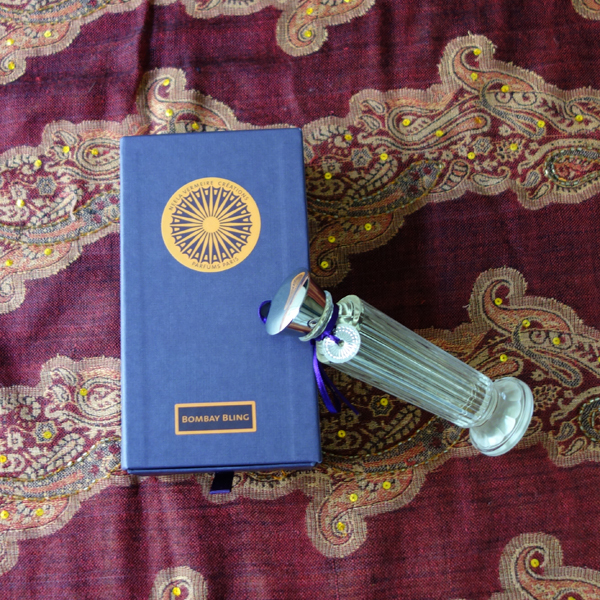 Notes: Heliotrope, tobacco, ginger, pepper, benzoin, labdanum. Lila: The Oddfellows is a club that anyone can join. It’s pretty great. They have premises all over the country. It’s not a gentlemen’s club but it might have been at some point in the past. Sabine: The Odd Fellow’s Bouquet is one of those fragrances that doesn’t change much. Lila: It’s a bit masculine for me. Audience member: It’s very tobacco-y. Notes: Lavender, bergamot, lemon, mandarin, rose, vetiver, patchouli, vanilla, amber, musk. We know perfumes can change as they develop and I try to put that into my images. Jicky definitely develops over time so you might want to leave room in your picture for how it smells in 10-20 minutes time. Notes: Chestnut, orange, orange blossom, coffee, maple syrup, ebony, heliotrope, vanilla, tonka, sandalwood. Lila: This is the latest release from L’Artisan. Sabine: I looked on the Basenotes database and the number of perfumes with black in the name hugely outweighs white. I haven’t done an image for Noir Exquis but I would use just a little black. I’d mostly use toffee, caramel and beige. Notes: Jasmine, carnation, bitter red orange, Turkish rose, orange blossom, tobacco, hyraceum, styrax, vanilla, hay, patchouli, bergamot, oakmoss, cumin, birch tar, castoreum. Sabine: We’ve saved the best till last. Lila: You won’t be able to smell anything else after this! Sabine: I used a lot of red in my image. Not a rose red but a fleshy red. It was blurred on Facebook for a while because it was thought to look like female genitalia. Lila: We’ll put all the Salome pictures together and share with Liz Moores of Papillon as she’s a friend and supporter of PLL. 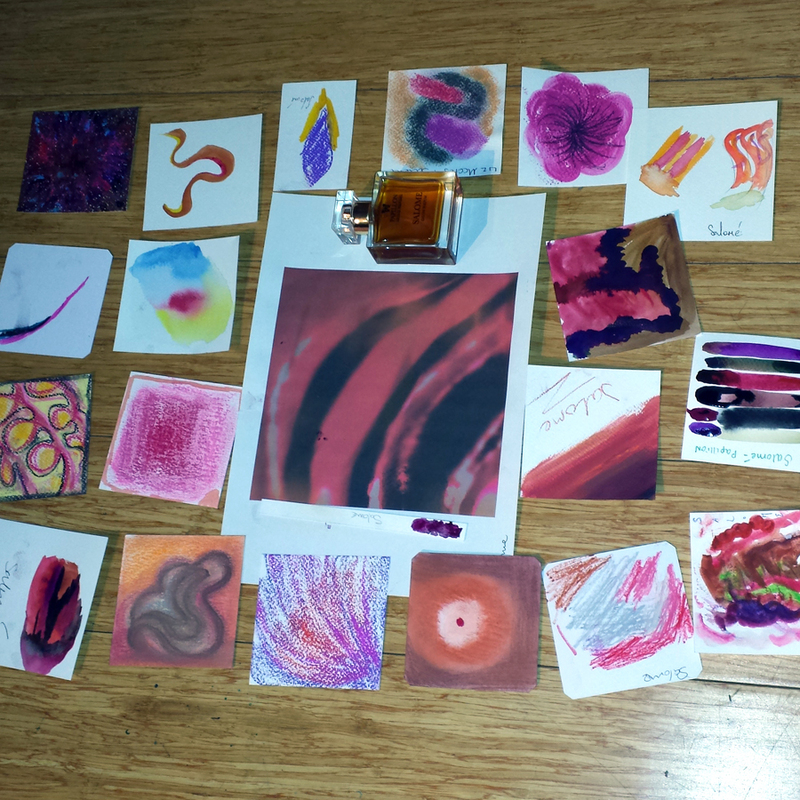 It was a great evening and we were all engrossed in creating our own visual interpretations of the fragrances. It was interesting to see how different our impressions were. Most people saw vetiver as green or brown while I saw it as grey. Sabine’s husband and I saw Sel Marin as the Atlantic sea under a slate sky, while two other people on our table saw it as a blue sea and bright yellow sun. When you’re trying to visualise the scent as colour it really makes you think and analyse the aroma in a different way. I found this fascinating and it has definitely added to the way I interact with fragrances. Many thanks to Lila and Sabine for such a novel, interactive evening and to Roulier White for supplying a couple of the bottles. Please answer the question for Undina’s Entertaining Statistics post: What perfume do you most associate with a colour/colours, which one(s) and why? In the comments to Tara’s recent beautifully evocative review of L’Artisan‘s Tea for Two (you have to read it if you haven’t read it yet – I promise: you’ll be charmed) several people mentioned they didn’t like the name. They didn’t explain why but it surprised me so I kept thinking about it. … singer China Forbes starts off with the seldom-heard introductory verse, which makes it clear that the whole thing is a fantasy. There is no tea, and no twosome. She’s making it all up, because her love life is a disaster. […] Their [Forbes and Scott’s] “Tea for Two” becomes the confession of a woman and her imaginary lover, their innocence shielding them from all the things that might go wrong. Since there’s no real video for the clip below can I suggest listening to it while quickly scanning through the rest of the article? But I had a feeling that I knew this song… well, at least a line from the song (“tea for two and two for tea”) long before then. But from where? I haven’t heard this song before – either when I still lived back in my native country or after I moved to the U.S. But somehow I knew those words and recognized the tune… When I found the explanation I was amazed. Shostakovich wrote it in response to a challenge from conductor Nikolai Malko: after the two listened to the song on record at Malko’s house, Malko bet 100 roubles that Shostakovich could not completely re-orchestrate the song from memory in under an hour. Shostakovich took him up and won, completing the orchestration in around 45 minutes. Tahiti Trot was first performed in Moscow on 25 November 1928, and has been a popular encore ever since. Of course I liked and recognized the melody! Of course I thought it was a great name for perfume! 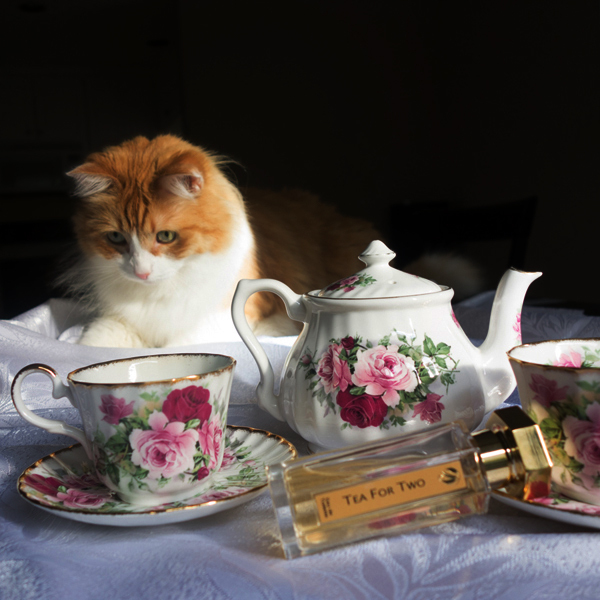 And when I tried Tea for Two perfume I immediately liked it as well. 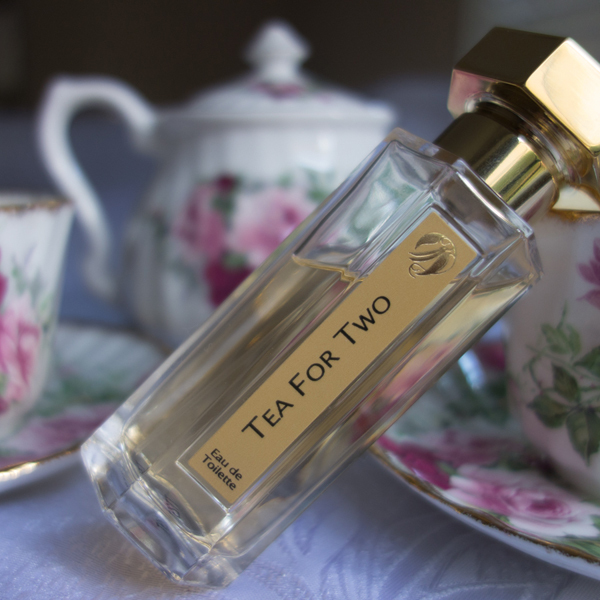 Tea for Two is the only bottle from L’Artisan Parfumeur in my collection. And it’s one of a very few that are truly shared perfumes in my collection: I enjoy both wearing it myself and smelling it on my vSO. Perfume for two. I have one more “musical” association for this perfume’s name (in case you still haven’t changed your mind about it). It’s an abstract linguistic joke I heard many years ago (told in Russian). Recently I discovered that it exists in some other non-English-speaking cultures (probably in those without long and short vowels). Concierge: (cheerfully) How can I help you? I keep murmuring that Tu-ti-tu-rum-tu-tu for the last couple of weeks. 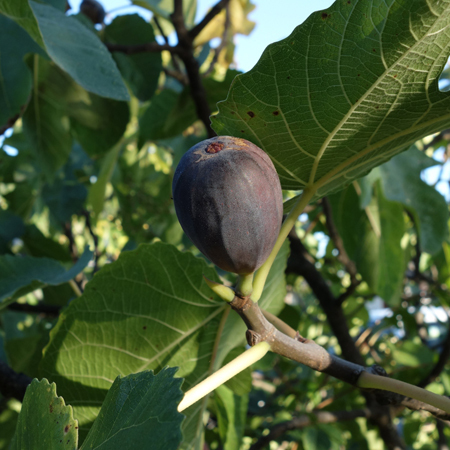 Three years ago I published the first Single Note Exploration post about fig note in perfumes and learned from comments that it wasn’t actually fig fruit that had a scent reproduced in perfumery but fig twigs and leaves. Since then I assaulted a couple of fig trees and can confirm: those twigs are very fragrant. Did you know the source of the scent? – You do know that those crunchy things inside are wasp eggs? 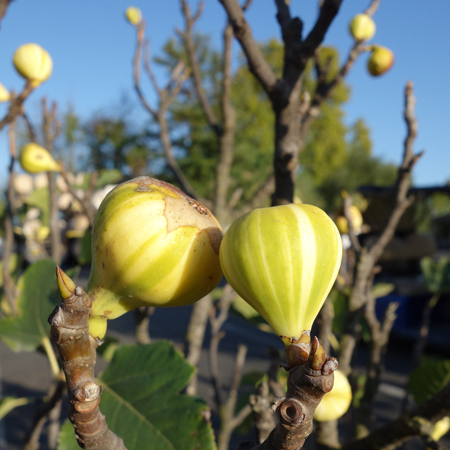 – You know, those seeds inside figs are not just seeds – they are eggs that wasps lay inside figs. I’d never heard anything about that before so I didn’t believe her and went to consult a trusted source – Internet. What I found enthralled me. If you are familiar with the subject skip a couple of paragraphs – there will be a perfume-related bit in the end. For those who – same as I – somehow missed that and doesn’t want to do a full investigation, here’s a short* version. A mature female wasp crawls through the opening into a fig where she deposits both her eggs and pollen she picked up from her original host fig. Since on her way in, having to force her way through a very tight opening, she loses her wings and antennae, after completing the mission the wasp dies. Eggs hatch, develop into larvae and then mature. Mature male wasp, which doesn’t have wings, mates with a female wasp and then digs a tunnel out of the fig through which the females escape. Once outside a fig a male wasp dies and a female flies to another tree, where she’ll pollinate another fig on her way in. The cycle repeats. Now, when I know all that, will I stop eating figs? Nope. The only thing that bothers me in all that is that I’ve never heard about it before. Of course, figs weren’t widely available where I grew up but neither was salmon – and still we learned at school about them moving upstream to spawn and die. And we all heard about sexual cannibalism of mantises. But nothing about fig wasps. Even though from the set of perfumes I tested for the first post I already had two favorite fig perfumes – Fig Tree by Sonoma Scent Studio and Wild Fig & Cassis by Jo Malone, since I like the note, I kept testing fig-centric perfumes and found several worth mentioning. There are two nice budget choices for those who would like to wear a fig scent a couple of times in summer but doesn’t want to invest much into it: Mediterranean Fig by Pacifica (read Victoria’s (Bois de Jasmin) review here) and Fig Leaf & Sage by Kiehl’s (Ayala (Smelly Blog) reviews it in the post on sage note). 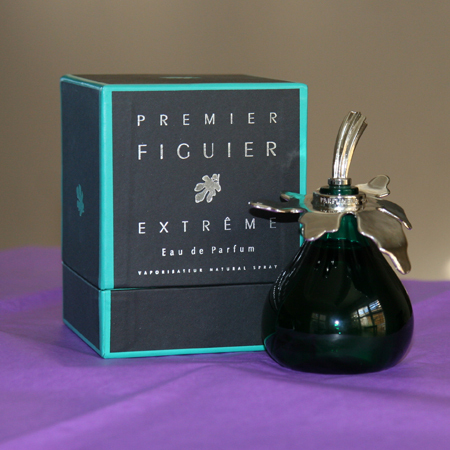 I’m on the fence about Premier Figuier Extrême by L’Artisan Parfumeur. It is a very nice, and said to be the very first, fig-centric perfume. But, like many other perfumes from the brand, it’s not tenacious enough to justify a full price purchase. Luckily, it’s not that hard to find a better deal for it (~$115/100 ml) online. And it’s one of those perfumes 100 ml of which might not be too much: even though it’s marked as eau de parfum concentration it wears as eau de toilette. Since I have a soft spot for interesting bottles, I couldn’t resist a fig-shaped Special Edition bottle. For reviews read: Victoria’s (Bois de Jasmin) post and Portia’s (Australian Perfume Junkies) guest post on Perfume Posse. Finally, I did get to test a perfume, lemmings for which were created by a very persuasive review from Gaia (The Non-Blonde) – Figuier Eden by Armani Privé. I like-like-like it! But I’m not paying the price: not because Figuer Eden isn’t good enough but I don’t think there can be any fig perfume that can justify that price. – Did you know that wasps lay eggs in figs – I asked my vSO when I got home the day of the conversation with my co-worker. * The detailed picture is even more complex and covers fig trees/flowers’ gender, not pollinating wasps and much more. You can start from this Wiki page and then follow links. I know how it sounds to the most of my readers but I have to say it: we had an unpleasantly warm January. Don’t get me wrong: I enjoy the light jacket weather as much as the next freezing east coaster would but we really need at least some rain. And +22˚C (71˚F) isn’t a normal temperature for this month even in our region. So now I can’t even pretend that it’s winter and time to wear my winter perfumes. 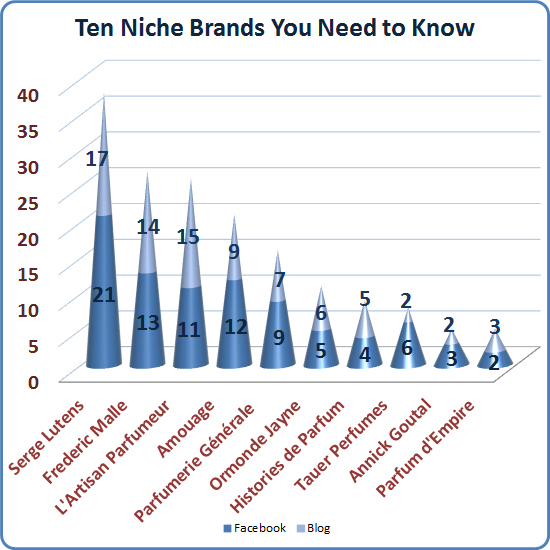 For this month’s statistics post I asked you to name five niche brands that, in their opinion, are in the “need to know” category for anybody who’s interested in perfumes. I asked the same question in one of the perfume groups on Facebook. 29 people participated on FB and 19 in the blog. 49 brands were named, 26 of them more than once. The chart above shows actual number of votes for the top 10 recommended brands. From my original list only Ormonde Jayne didn’t make the cut and moved to the sixth place. I need to get more samples from Parfumerie Générale line and see why it made it to the fifth place. Out of 52 perfumes I wore or tested in January 17 perfumes were from 5 out of these 10 brands. What was unusual: this month I tried only five perfumes for the first time. Did you come across anything interesting this year? Rusty had nothing to do with any of the numbers but he has to requite all the compliments he got in the previous post – even without appearing in it! These are pictures of him with perfumes from the “need to know” list. 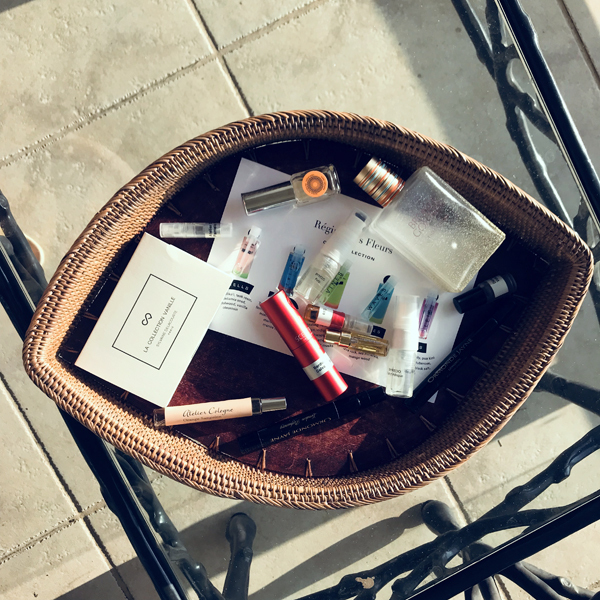 Don’t ask me how but a couple of months ago I came across the article 20 Niche Perfume Brands You Need to Know Right Now. As it usually happens, while reading somebody else’s list of anything on a subject you’re interested in, I agreed with some of the choices, disagreed with others and thought of additional nominees. And then I started working on my list and realized that 20 were too many. Not because I can’t easily come up with at least three times as many brands but because even at 20 one starts including brands that are just personal favorites, do not exactly fit the definition or those that are so tiny that position on the list is too big for them. The brand should be a true stand-alone brand, not a private/limited/boutique line of a big brand (so not Guerlain, Chanel, Dior or Hermes) or a spin-off under a bigger parent’s umbrella (Tom Ford and Jo Malone are out too). The brand should have enough perfumes in their range to potentially work for different people (so as much as I love Neela Vermeire Creations or respect vero profumo and Puredistance, these lines are too young to get a spot in the short “must” list). Brands should be available for testing (directly or through online services) both in the U.S. and Europe (so no tiny artisan brands for this list). Serge Lutens (http://www.sergelutens.com/) is probably the ultimate niche perfume brand. It’s bold, unconventional but at the same time still perfumes that you want to wear and not just test, analyze and review. Kafka (Kafkaesque) covered the topic of Serge Lutens – both a persona and a brand – extensively and I urge you to read Part I and Part II of her story. Amouage (http://www.amouage.com/) is an epitome of opulence, luxury and quality. 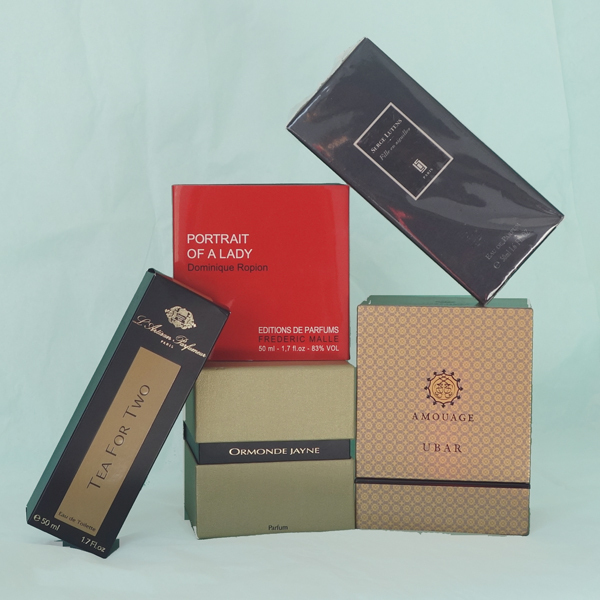 These rich and mostly classic perfumes won’t suit everybody in the modern sheer-smelling world but the brand is worth knowing even just for educational purposes to see how perfumes can be anti-minimalistic and not transparent. Watch four short videos on now smell this in which Christopher Chong, creative director of Amouage, talks about perfume and the brand. L’Artisan Parfumeur‘s (http://www.artisanparfumeur.com) perfumes might be not the most innovative (though over years they’ve created some very unusual perfumes) but very wearable, so it is a perfect starter house for anybody who wants to venture from the mainstream perfume market into the niche one. Read Luca Turin’s L’Artisan Parfumeur 30 years later for the tidbits of the house’s history. Ormonde Jayne (http://www.ormondejayne.com/) has a whole line-up of very likable and distinct perfumes at reasonable (for modern niche market) prices. 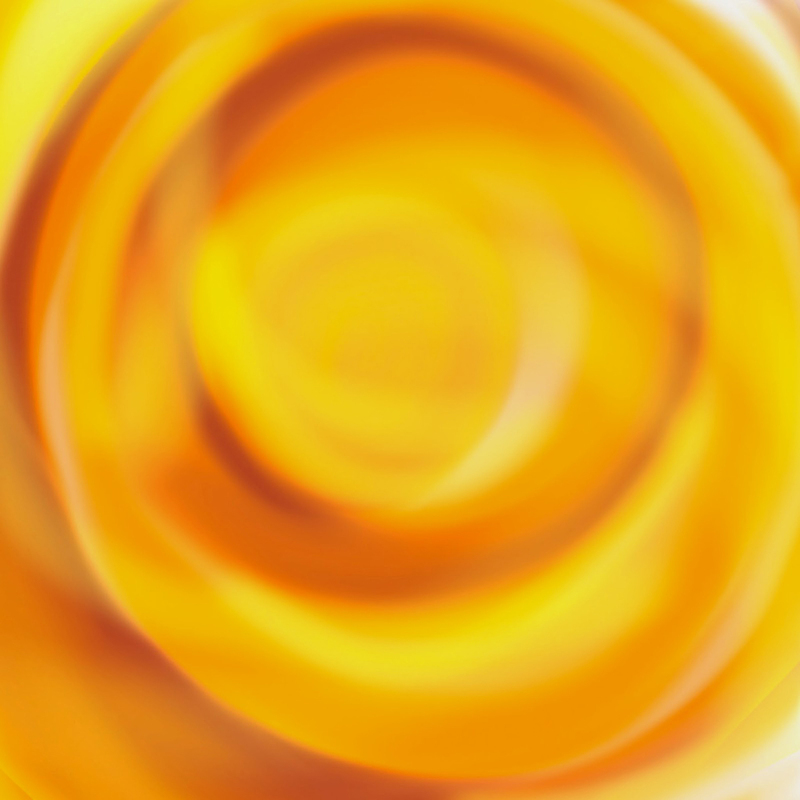 Ormonde Jayne’s perfumes smell modern and classic at the same time. Read a very warm and personable interview with Linda Pilkington by Sigrun (Riktig Parfym) and a recent Andrew Buck’s (Scentrist) chat with her for more information about the brand. So these are my choices of the “need to know” niche perfume brands. Give me your five choices. Do not try to purposefully complement my list: if you agree with all or some of my choices – say so; but feel free to change any or even all brands if you have a different answer to my the question. I’ll try to do something with all the answers for my January statistics post.